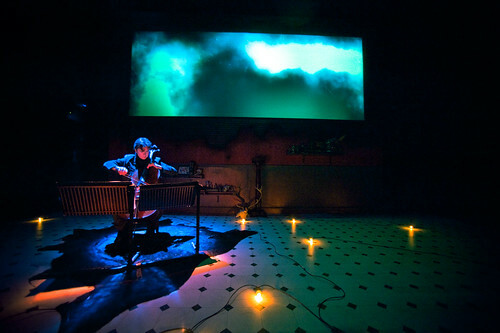 This month, an ensemble of five extraordinary musicians takes to the road to perform graphic scores (see ‘Sound code image’ in Eye 26). 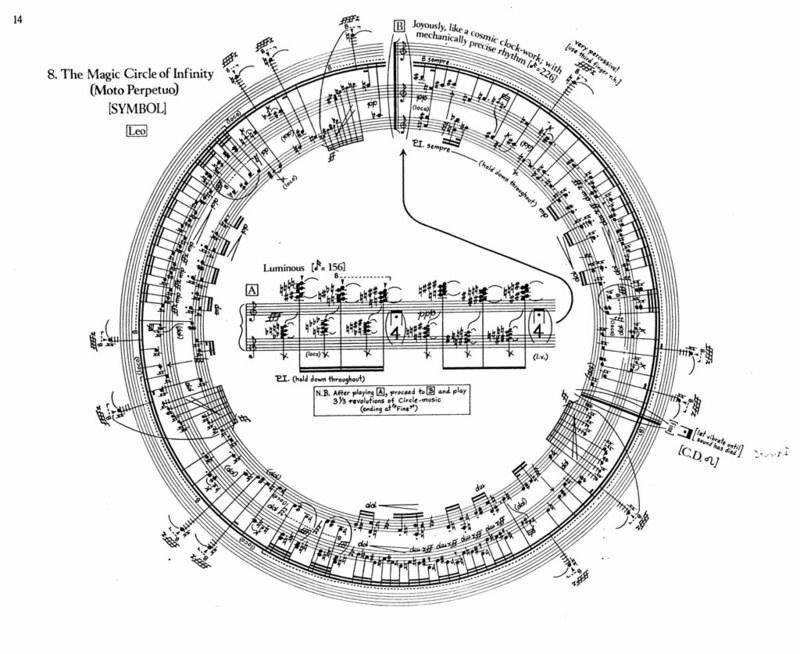 Top: George Crumb, The Magic Circle of Infinity (Moto Perpetuo), 1972. Part 8 of Makrokosmos Volume I, commissioned by pianist David Burge. 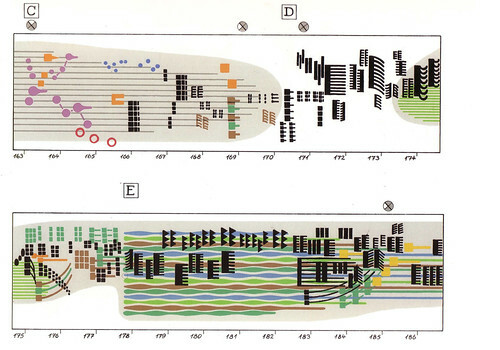 The programme includes some of the most famous (or notorious) examples of graphic scores from the postwar era, including work by Crumb, Ligeti, Cage, Cardew and Berberian, whose Stripsody will be sung by Elaine Mitchener. 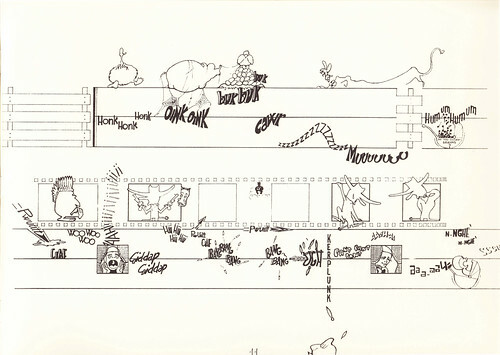 Cathy Berberian’s Stripsody, 1966. Comic-book drawings and lettering by illustrator Roberto Zamarin. 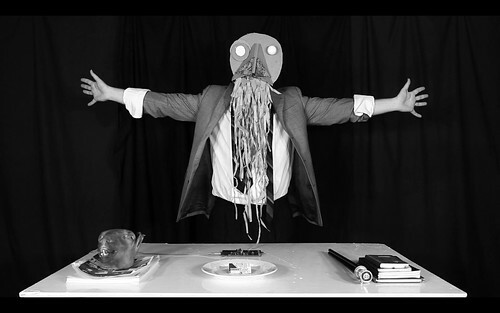 The other four musicians in this avant-garde ‘supergroup’ are Isambard Khroustaliov (aka Sam Britton, electronics), Tom Arthurs (trumpet), Oliver Coates (cello) and Joanna MacGregor (piano). The programme includes a mix of solo, duo, trio and ensemble pieces. Turning such squiggles, smudges, symbols and signs into coherent music requires a special kind of musical alchemy, a familiarity with improvisation and courage. 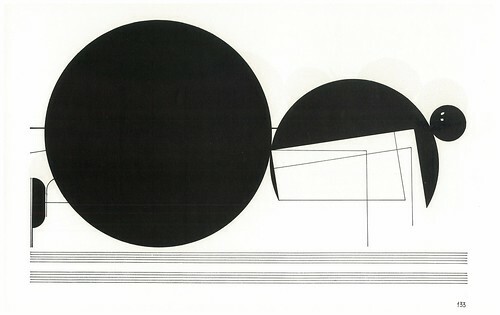 Page 133 of Treatise, 1963-67, by Cornelius Cardew. 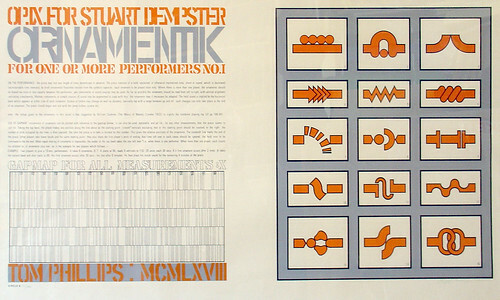 The programme includes several graphic scores by polymath Tom Phillips, including Ornamentik, which some Eye readers may remember from our first-ever ‘Archive Night’ at the Victoria & Albert Museum. The tour kicks off tonight at the Turner Sims Hall in Southampton, and continues with concerts in Manchester (4 Oct), Gateshead (5 Oct), London (6 Oct), Leeds (11 Oct) and Oxford (12 Oct). 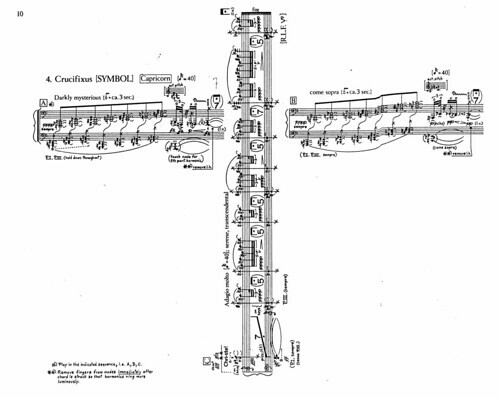 George Crumb, Crucifixus [Symbol], from Makrokosmos, Volume I, 1972, the fourth of twelve pieces. The tour was planned in collaboration with Theresa Sauer, the editor of Notations21. Unfortunately Ms Sauer is unable to come to the UK. 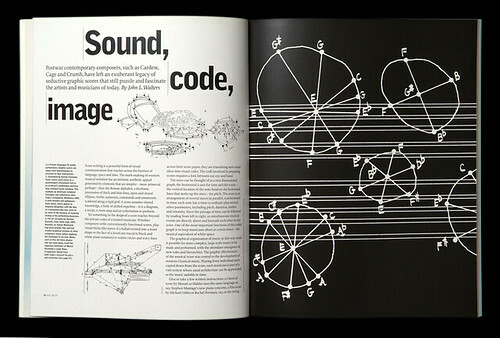 Spread from ‘Sound code image’ in Eye 26.